There are a lot of benefits that one can gain from fishing that ranges from helping you to keep your health in check with the interests of the food that one gets from it. One of the most valuable equipment that is necessary for fishing, however, is the fishing line. Qualities that would aid in identifying the best monofilament fishing line are enumerated in this review. There are different types of fishing lines out there that one can get, and they can be classified into two depending on how the material used for the line. There are monofilaments fishing line as well as multi-filament lines. As the names of each imply, the monofilament refers to those done with a single strand of material, while the multi-filament line relates to those strung from multiple strands that are fused, bundled or braided together. 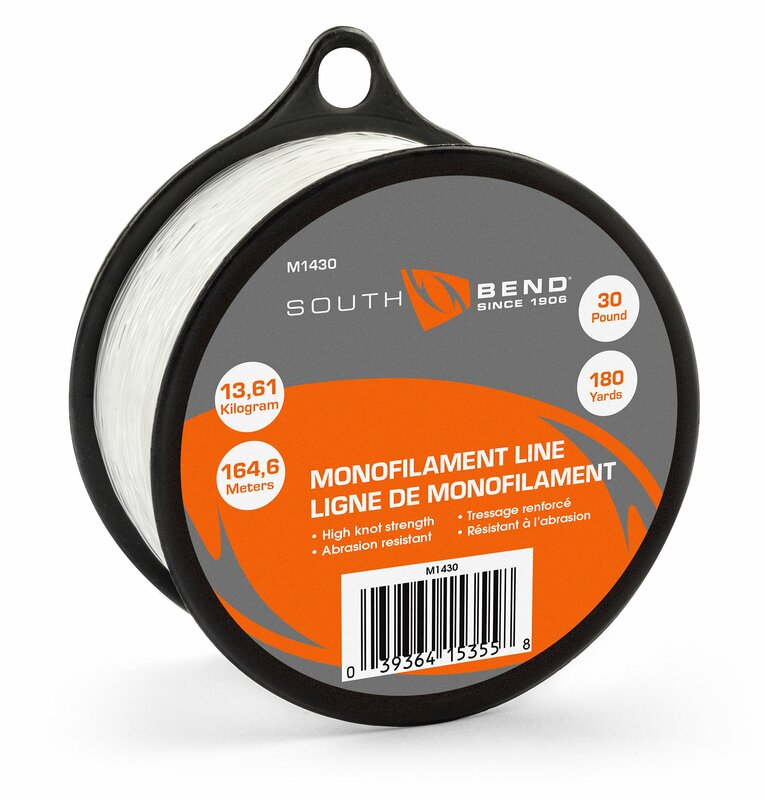 The monofilament line has some advantages when compared with that of the multi-filament lines. Some of its benefits include the ease with which it can be handled due to its flexibility among others. Due to the flexible nature of monofilaments, it makes it very easy to use, and it also works very well in a lot of fishing situations. This easy handling alone makes it a choice of line. Its flexibility that makes it easy to use is described as limpness, and it makes the mono much more manageable and also easier to cast that other stiffer lines. No one likes to go on vacation fishing only to end up struggling with your fishing line. Its ability to stretch when being used. Mono are known to stretch even more than super lines as well as fluorocarbon that gives you a range of opportunity that is absent in a lot of another type of lines. Even if your drag sticks or you set the hook too hard, you can rely solely on mono compensating for this by stretching by up to about 25% or even more. This further complements the ease with which the mono can be used. Even if a newbie wants to go fishing, frustration won’t be the order of the day for the fellow. Furthermore, another advantage that the stretching ability of the mono gives you is that it prevents your hook from making any damaging hole to the mouth of your fish as it will stretch under pressure leaving your fish unbuttoned. The shock strength of the line. You should note that this is not the same as the resistance of the line, as it is rather the ability of the line to withstand the shock that it receives when the hook on its end gets a catch. It is of very great importance, as it plays a vital role in determining how good a line is. Monolines usually have a real shock strength which ensures that they can withstand the struggles of any fish that it gets. The large diameters of the mono. Although there are some demerits to a line with a larger diameter regarding how deep your potential catch dive, there is, however, an advantage to the extraordinary breadth, such as slowing the fall of a power bat, soft bait or a Berkley Gulp. It also has an advantage when the bait is being threaded over a cover, as it resists more abrasion. Monos come in varieties of colors. There are different options to choose from in terms of color when compared with that of other lines. This is mainly due to the ease of which they are produced by the manufacturers who make them when compared to the tinting of other types of lines. You can easily opt for the private, low-visibility options like blue, green, or going for the bright ones that have a high proportion of shades that is just perfect for line-watching presentations. You can also go for a twist of both, as some mono manufacturers like Berkley Trilene TransOptic, gives you that option by giving you a mix of the two kinds from bright gold in sunlight to remove just below the surface. Tying of knots in the mono can be done easily. It is among some of the few knot-friendly lines available around. It gives you the opportunity to make use of a range of different healthy, and easy to tie knots without compromising its strength. There are in fact some ties that give about 100% knot strength when used with a premium mono. The volume to weight ratio of the monolines are usually high; that gives them enough buoyancy to give them slow sinking. This is a beautiful choice for top water lures where you prefer a slow downward movement of the bait. Another reason to consider using the mono line is the fact that they are pocket-friendly and not expensive at all. Considering how important this particular piece is to fishers, it is very cheap for what it offers. Looking at the monolines generally, it is quite evident that they were built for ease, and also to allow beginners fish quickly. Even though it is easy to handle, that does not mean that it is limited to the experts. It rather makes it all the better. The features listed above gives the monolines an edge over other line counterpart which makes them an excellent choice for fishers looking for a memorable experience. 1 Monofilament Fishing Line Reviews: What is the Best Monofilament Fishing Lines 2019? Monofilament Fishing Line Reviews: What is the Best Monofilament Fishing Lines 2019? 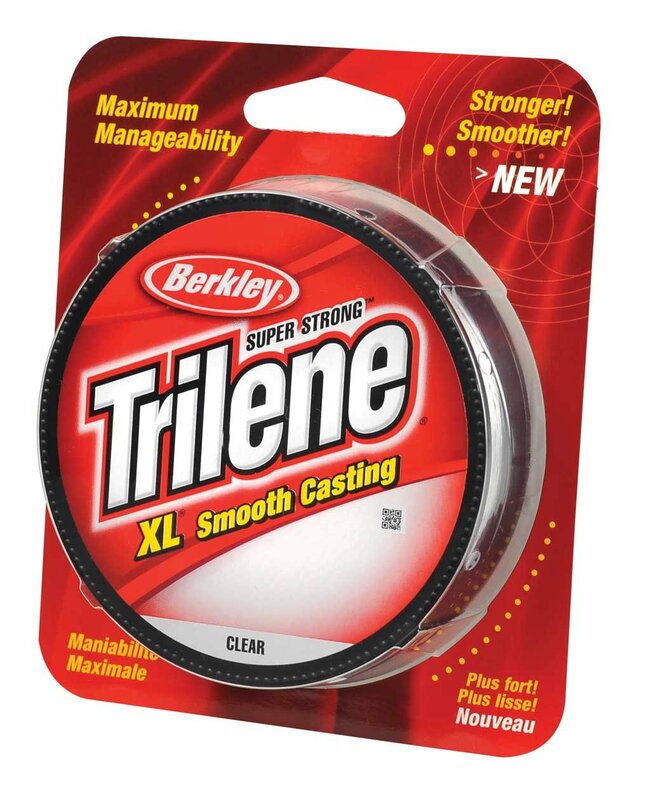 Berkley produces some of the most popular monofilament fishing lines in the world. 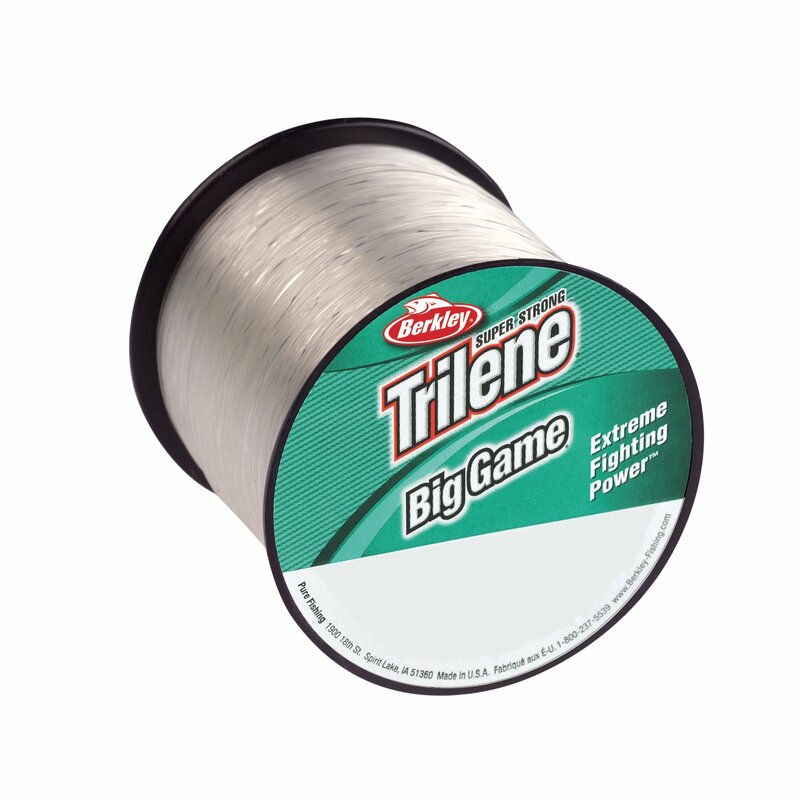 They have been known to offer good and long lasting lines to people with their big game lines. It is one of the best fishing lines that one can get that provides one with the best fishing experience. It has an exquisite knot strength which is almost a 100%. Although you may be able to get better lines that cost way more than this, you can hardly get one that gives you the maximum return for your money. There have been a lot of reviews from the previous users and current users of the line testifying to how great the line is. It is super high and can get you some of the biggest fish without any fear of the line breaking whatsoever. It has also proven to be abrasion resistant as it has sometimes been used in rivers where there are a lot of tons of rocks, sticks and the likes. The color that it also comes with been green makes it really visible to see. This will enable you to know how your line is moving when a fish is hitting your baits. Hence, if you are on the lookout for cheap fishing, then this fishing line is a go for you. It also lasts for a very long while, which means that you do not need to worry about getting any other one anytime soon. 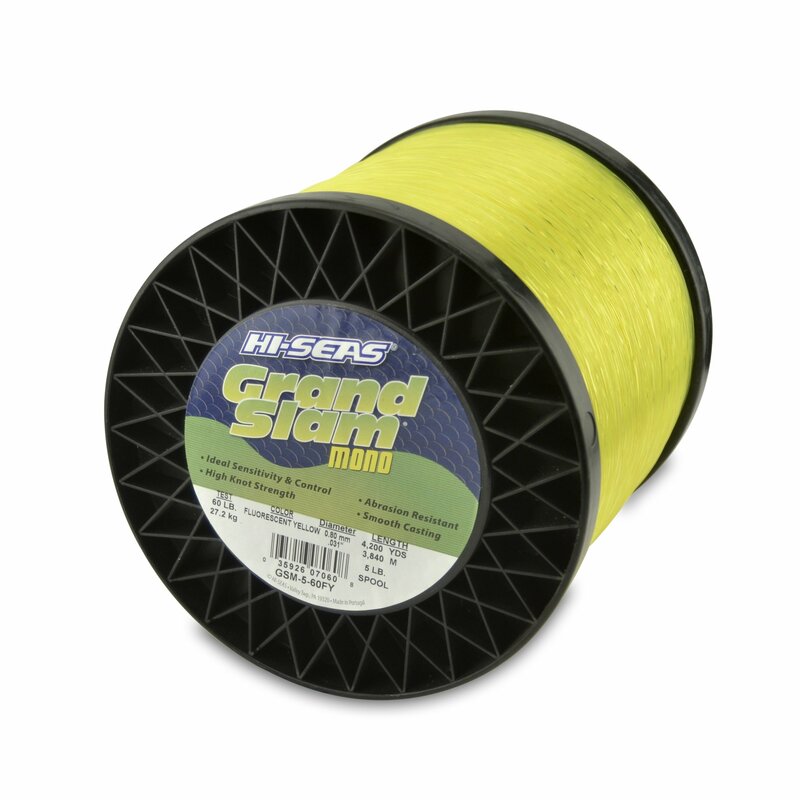 Grand Slam is a big name in the brands of fishing lines. It combines high strength, high abrasion resistance as well as great knot strength to give you the maximum satisfaction from your fishing lines. It is also specially designed for conventional and spinning tackle. Every single part of the line has been checked by a computer to ensure that the diameter is uniform all through, and also to make sure that the breaking strength of every part of the line is in good condition. This particular fishing line was designed specially to give you confidence in when going for your fishing tours. The line is found to be a lot stiffer even than some lines that are costlier than it is, and it also rarely breaks. Its color, yellow, was specially chosen to ensure good visibility of the line when under water so you can easily avoid getting your line tangled with the lines of others while fishing with others. Some previous users of both grand slam and other mono fishing lines have also testified to the superiority of this particular line. It compact every single thing that you want in a line in a single product. Tying knot can be an issue. With a fragile diameter, tying of knot with this particular lie gives you almost 100% power that stays active and also stays in place. It is also sold at a very low price when it is compared to other fishing lines. It also has quite a good strength sufficient for catching a relatively large fish; there have been some users that claimed to have caught about 15 pounds of fish with this line. Apart from their use as a fishing line, they are also used for other purposes due to their high strength. It can be used to support balloons and lights for small parties, stringing our wind chimes, tie down snowboards to the roof of your car, bundle up firewood, fasten your tent, so it doesn’t get blown away, or even tow a truck. This line is one of the best-selling monofilament in the United States. It has a splendid knot strength that is even much greater now than the ones previously available. It is flexible which enables one to enjoy a smooth casting for maximum manageability. It is also one of the highest lines that you can get out there, as some of its previous users claimed to have been using it for years without any problem. It also has a little memory, so it does not quickly coil up over time whenever you leave it on your reels for a long time. It also resists abrasion well during the day. With all these quality packed up in a single product, this will be a perfect choice for anyone that has concern for the durability and how long their products last as this will give you the best deal. The main strength of this particular line lies in its strength and the visibility of the line. It is strong enough to catch big catch fishes of 20 pounds and above. To increase the visibility of the line, it glows; hence you are sure not to get your line entangled with that of others when fishing among a lot of people. As long as you stick to using this particular line right, you are sure to use it for a very long time. If you are on a budget to get an affordable line that has a real strength and is also visible, then you can decide to look no further as this is just the perfect one. In conclusion, getting the best out of your fishing line involves you taking the time to get the complete line for your fishing. Once you can get a good line, fishing will become a lot more fun and memorable experience for you. 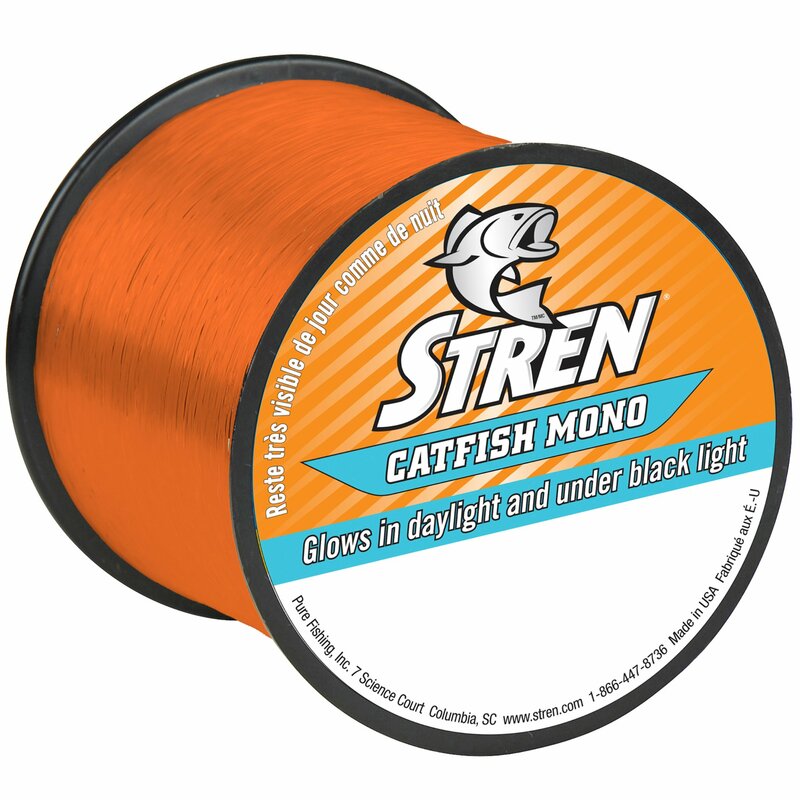 The Stren Catfish Monofilament Fishing Line is our perfect choice. Though it’s expensive, it will surely be worth your hard earned money because of its high strength and excellent abrasion resistance that cannot let it cut off easily.